As tradition goes, last night, my friend Vonetta and I saw the midnight showing of the newest Harry Potter movie. Man, let me tell you. I was emotionally spent when the credits rolled after the movie. I giggled, I laughed, I startled, I bobbed and weaved, I got misty, and I cried (and I only took a slight nap toward the start of the movie lol). I won’t give away any spoilers for you people out there like me who read the books after the movie (yes, I’m DYING to read book #7, but I have to wait till next summer) aand for those of you who have never read the books (and I highly recommend that you do–well-written stories and much better than the movies, which says alot because the movies are GREAT). But I will say that I love love love the relationships that have evolved over the course of this story. I love that Harry is very much a realistic character–someone with a gift that doesn’t want to share the burden with anyone else while carrying the world on his back. I love that he has true friends in Hermione and Ron (and Dobby and Hagrid and Luna (who I heart) and the rest of the good guy team). I love that their relationship isn’t perfect but they find ways to overcome their issues with each other and are still there for each other. I love that Draco Malfoy, who I’ve heavily disliked from the beginning, is still a realistic character, really struggling with his lot in life. I love that the villains are so well-developed that I really do despise them–Bellatrix and Snape (who Vonetta dropped a spoiler about on me last night, but I’ll give her a pass since it was 2:30 in the morning) and Dolores Umbridge. And I’m very patiently waiting to see the final battle between Harry Potter and Voldemort, and I can’t wait to see how the wand storyline unfolds. Before I sign off, I’d like to note that I saw for the first time in my Harry Potter movie going days someone dressed as Hagrid. Shout out to that guy!! Also, shout out to the guy who did a Tech fight chant as we awaited the previews. 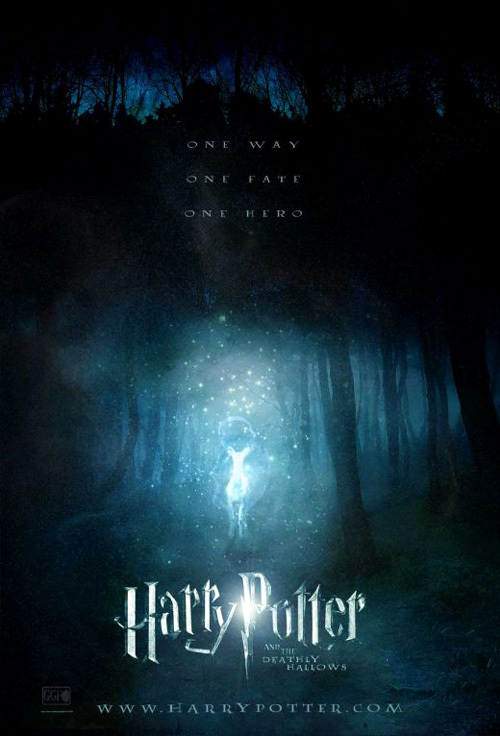 If you’re a Harry Potter fan, you will not be disappointed with Harry Potter and the Deathly Hallows Part 1. What a great way to kick off my birthday weekend! Happy Friday, folks! I am trying to wait til Monday to see it with some friends that read the book but…..